Facebook showed automakers examples of how to make use of the social media platform in an exhibit during the Los Angeles auto show media preview last week. 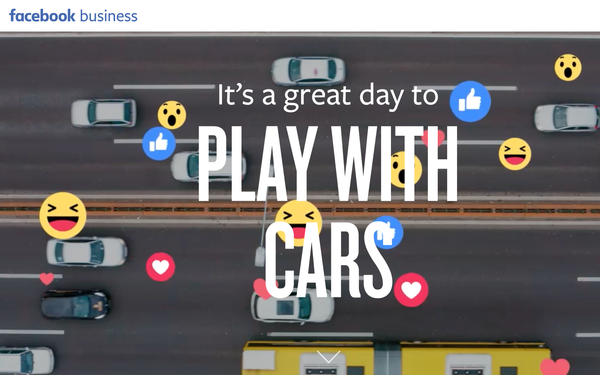 In addition to the onsite presence, Facebook is kicking off an automotive campaign. It aims to bring the LA experience online with an on- and off-platform digital campaign and the launch of an online hub featuring an auto creative best practices manual. The goal of the campaign (produced in a partnership between Facebook’s Creative Shop and video production house Ghost Robot) is to showcase video and mobile opportunities for auto marketers across Facebook and Instagram. This is the first time Facebook Auto has run a marketing campaign. At the LA show, attendees learned best practices at Story School, then put their education into practice through a series of installations that offer content for Story and video creation. Attendees learned how to string together a story, add filters, and even use dynamic video effects like Rewind, Hands Free and Boomerang. Acura's Messenger Bot was on display, giving marketers an opportunity to see the possibilities of reaching their audiences with Messenger. The purpose of an automobile is to move; to be in motion. And the moving picture is at the core of Facebook’s tools, specifically video and Stories. Facebook recently worked with Volkswagen on a campaign to launch its newest Jetta model. The automaker wanted to rekindle love for one of its most iconic vehicles and focused on targeting music enthusiasts. The Volkswagen team, in collaboration with the creative agency Deutsch, developed a dozen video spots that brought the Jetta to life by combining state-of-the-art 3-D computer-generated design with a color palette inspired by the vehicle’s available 10-color ambient lighting system. In addition to in-person pop-ups and influencers, PHD, the Media AOR, identified the Facebook family of apps, in particular, Instagram Stories, as the best platform to showcase the short-form content. As a result, the Jetta campaign outperformed VW benchmarks on ad recall (+17 points) and familiarity (+9 points), and moved purchase intent by 5 points. Besides highlighting a vehicle, there are other automotive applications for Facebook and Instagram, including during the buying process, according to the company. Facebook IQ recently commissioned Accenture to survey 1,036 U.S. auto consumers ages 18 and older to help marketers understand the mindset of today’s omni-channel vehicle shopper. The study found mobile devices are redefining the ways people shop for cars with 63% of car buyers discovering new vehicles online, and 30% discover new vehicles and brands on their smartphones or tablets. Thirty-six percent of users discover new automobiles through the Facebook family of apps. Social media plays an important role in automobile discovery with 78% of auto respondents finding some type of social media content useful when deciding on a purchase. The study showed that 52% of women cited sharing auto-related content, compared to 47% of men. Auto consumers want post-purchase engagement with 86% of respondents saying they'd like some type of engagement with their auto brand after purchasing a car, according to the study. 1 comment about "Facebook Launches Marketing Campaign Aimed At Automakers". Rajat Khandelwal from Carlo, January 17, 2019 at 3:43 a.m.